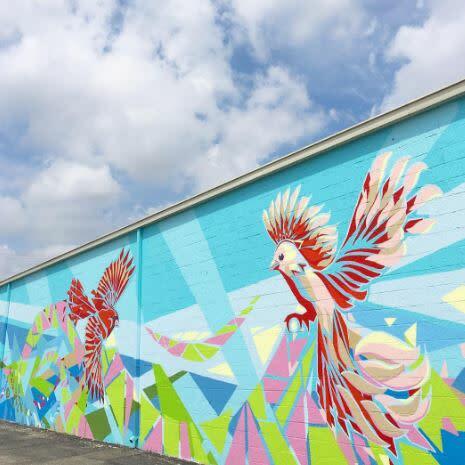 Posted on November 07, 2016 at 8:00:00 am by Jessa C.
Fort Wayne is having a major moment with murals, and we are not complaining! 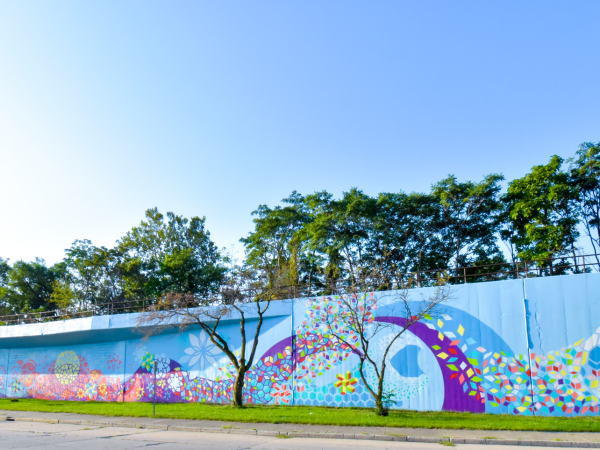 Fort Wayne&apos;s new murals provide a glimpse into our history, culture, and character. 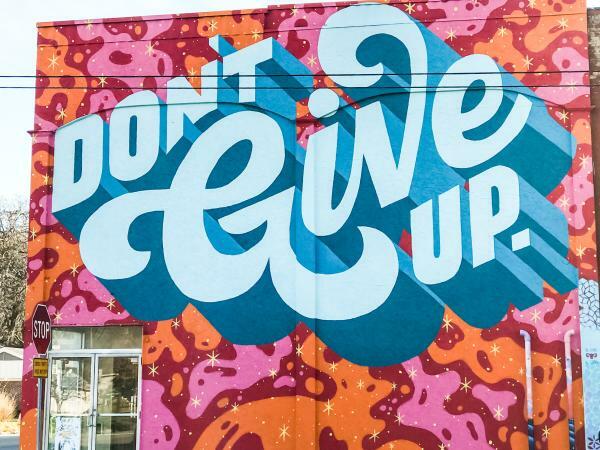 Plus, the murals around Fort Wayne represent the great arts community that works so hard to provide entertainment and thoughtful presentations. While visiting Fort Wayne enjoy the free art! Can you visit them all? Let us know by sharing with #MyFortWayne! Welcoming you to Downtown Fort Wayne from the east is the East Columbia Street Mural created by local artist Jerrod Tobias. Known as the Metaform mural, this beautiful 300-foot display will brighten any day! This mural isn&apos;t found on the typical side of a building. Instead, it&apos;s a great art piece in a fabulous location! Every mural serves a purpose or provides a story, and this mural is no different.Take a visit to the DeBrand Fine Chocolates downtown location for a sweet treat, and enjoy their new mural created by Jeremy Selzer. The story behind this mural is one of creating an ambiance. Tim Beere, co-owner of DeBrand, wanted the “…store to have an edge with an urban ambiance,” and he found the inspiration after eating with his wife and co-owner, Cathy Beere, at a New York City restaurant that featured urban street art. From the time and thought behind the design of the store, to the award-winning chocolates, DeBrand Fine Chocolates exemplifies the Beere’s investment in their business and in making Fort Wayne a great place to enjoy! Watch this mural come to life here and here! Another mural in Fort Wayne features a story about Fort Wayne’s history. The story of this mural works to evoke and pay tribute to the Native Americans who once lived on this land in Fort Wayne. 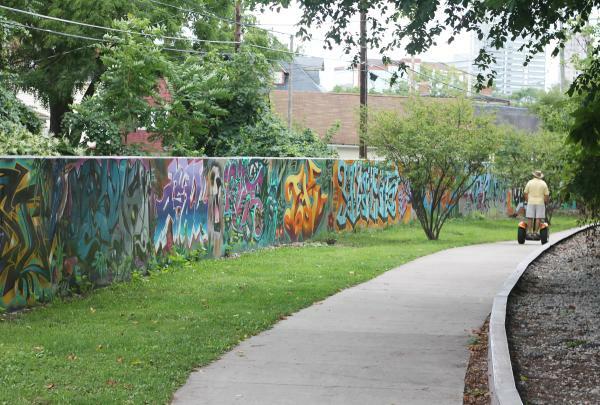 Learn more about the story of the Wild Boar mural here. The next in our lineup is the beautiful display at the Firefly Coffee House. Although I don’t know the story behind this display, and the many to follow, the collective whole of the murals in Fort Wayne provide the heartbeat and story of Fort Wayne. Arts United supports and helps promote many of the cool art displays and programs in Fort Wayne. Make a stop on the beautiful art campus to enjoy many of the public art displays like the crosswalk mural near their front entrance, chalk walks, and sculptures. This mural not only features the frog shown below, but also a hedgehog-like creation on the alley wall of Pint N Slice! Both murals were created by NoseGo, an internationally-recognized artist. NoseGo, Yis "Nosego" Goodwin, mixes fine art with a contemporary style to deliver highly energetic work. Plus, many of his designs feature various patterns, vibrant colors and distinct characters derived from his imagination and environment. 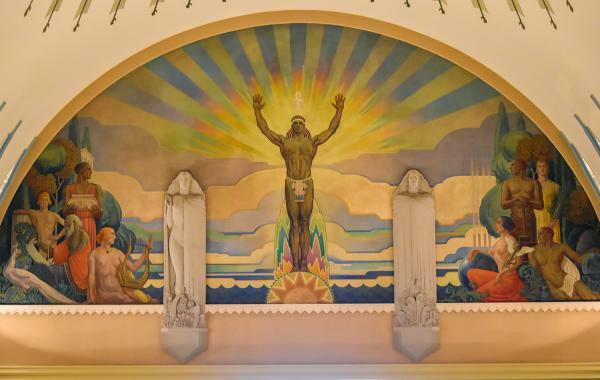 The Allen County Courthouse is not technically an outdoor mural display, but it’s still worth a stop to explore the murals inside the courthouse. A self-guided tour is available for free, just remember to leave your camera and phone in the car or your hotel room. The Lincoln Tower is also not technically an outdoor mural display, but it’s worth a stop to explore the murals inside the bank. Pick up an information sheet and enjoy the beautiful murals and design. Please note, if you take photos inside the building you will need to sign a waiver because the photos cannot be published. On your visit to Fort Wayne, take a detour or make an effort to visit and appreciate the beautiful public art located all around the city like the Sculpture with Purpose bike racks, and get a glimpse into Fort Wayne’s history and story! 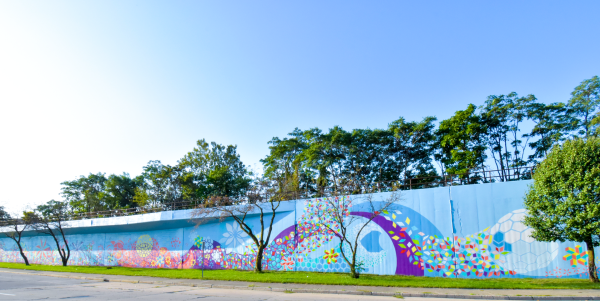 We are sure there are more to come, but if we missed any murals send us an email at Marketing@VisitFortwayne!